We arrived in Savusavu August 10th. Savusavu isn’t very big, but it’s my favorite of the bigger “cities” in Fiji. Compared to Lautoka, Nadi and Suva, Savusavu is easy to get in and out of, the water is cleaner (but not clean), the town is very cruiser friendly, not very touristy, and nearly everything is in walking distance. We did our formalities, suffered through a few days of rain, and then (very exciting!) we picked up our replacement battens. Our battens had fallen overboard when we left the boat in Neaifu. Poor planning on our part because we forgot to lash down our stack pack. We had lost the three largest battens. There’s not really a sail loft in Tonga, so we contacted Marshall Sails in Vuda, Fiji to order the correct battens from NZ and ship them to Nadi and then Savusavu. Picking the battens up was fun – we had to take a taxi and held the 20-foot long package to the side of the car as it drove us back into town. 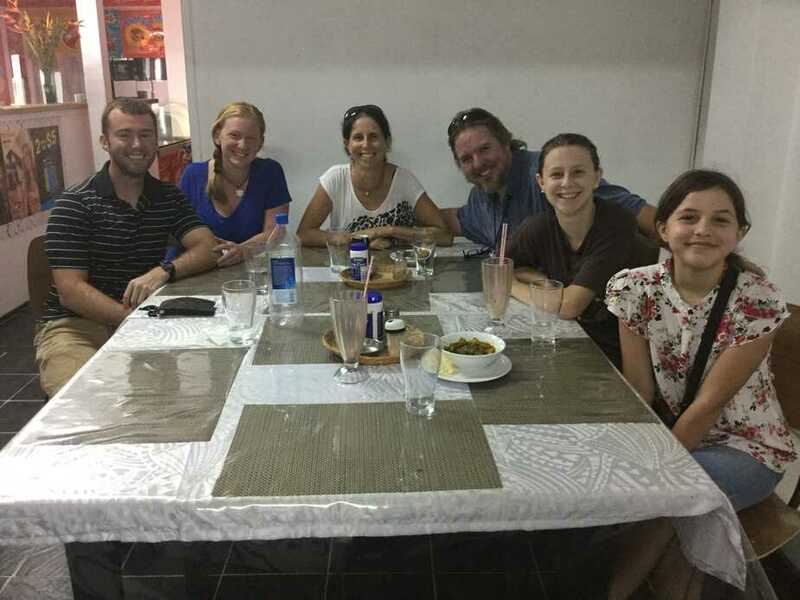 We had the pleasure of finally meeting the family of four aboard Del Viento. 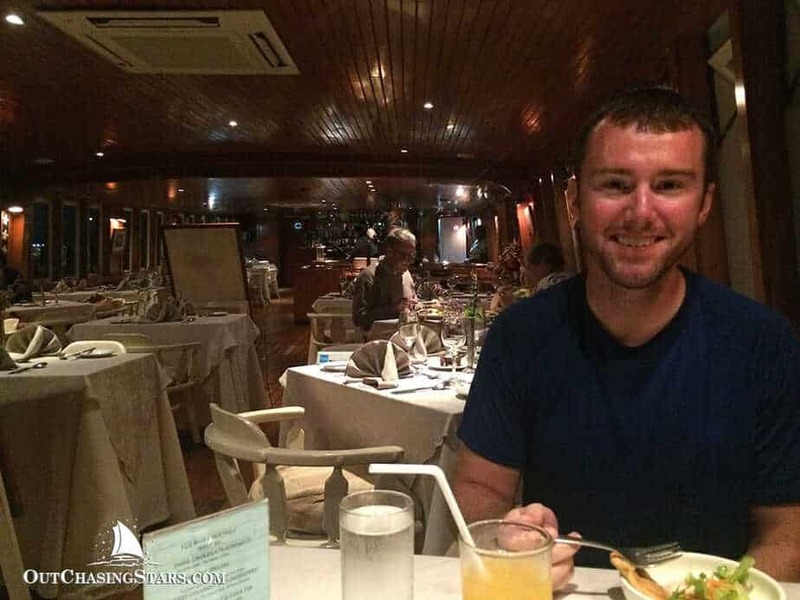 I’d been following their blog for a few years, and Michael has written several articles for Cruising World and is the editor for Good Old Boat. Michael has also written Selling Your Writing to Boating Magazines, which I recently have read and found very, very helpful (more about that in the future hopefully!). That’s not all – my Uncle Phil worked with a woman named Mary Kate, who is very close friends with Michael and Windy. Another one of those 3 degrees of separation friendships. Anyway, we met the family over Indian food in Savusavu, and before we left we had them over for a game night. It was fantastic to meet them, and perhaps our paths will cross again soon. There was a group of cruisers who were meeting every morning at 9 am to hike up to the top of the nearby hill. I joined them twice, and it was a great view over the harbour. 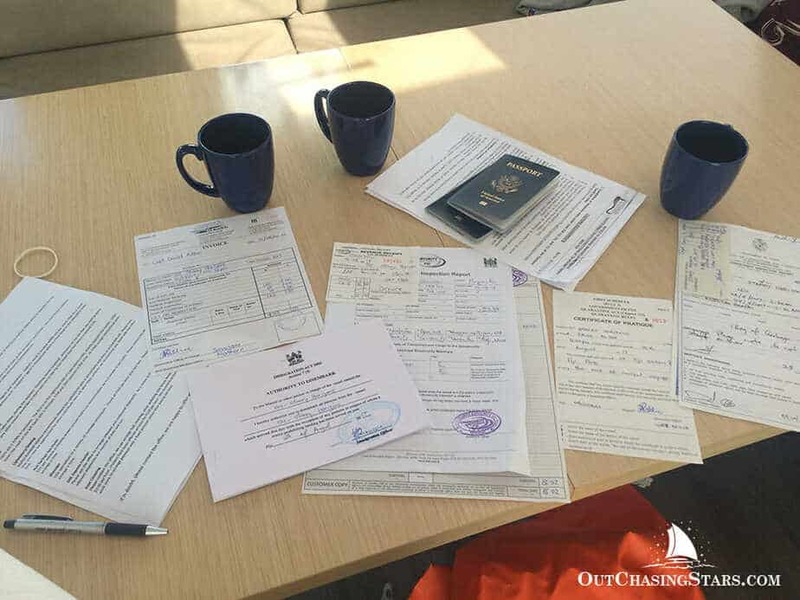 We flew to Suva for two nights to handle the medical evaluations for our Australian visas. I thought this would be a great opportunity to do some shopping. My family is coming to visit at the end of September and while it’s great that they can bring us stuff (a common cruiser practice), I don’t want to burden them with too much luggage. David and I even argued about it a little bit – he wanted to order things in the states to get shipped to my parents, while I wanted to buy as much as possible here. Now, obviously there were some things we needed and those couldn’t wait. Somehow, the gas tank for Little Dipper developed a crack in it, and that’s something that needs to be fixed ASAP. Every time it rains, our gasoline gets water in it, and upon start up we get a lovely cloud of black smoke. We did try to fix the tank with epoxy and duct tape, but no luck. Thankfully, we were able to find a replacement tank at the Yacht Shop in Savusavu, so not only could we replace it with a bigger gas tank, but we didn’t have to buy it in Suva and fly it over. However, with pretty much everything else, David ended up being right. We did buy some small things in Suva – dish towels, cleaning rags, a SD card, but that was a mere $30 FJD of spending. I love the idea of spending in the local economy that we are visiting, but the rest of the items on our list were either impossible to find (like the zincs we need or the GoPro we want) OR they were ridiculously expensive. We looked at phones and cameras and the prices were outrageous. A 66% price increase doesn’t mean much for $12 hand towels, but when you are looking at electronics, having guests bring you items can save literally thousands of dollars. So we went back to Starry Horizons pretty empty handed, but that was fine. Our main goal was the visas, so we accomplished what we wanted. David was right. We did, however, enjoy a few meals out and a movie in the theater! 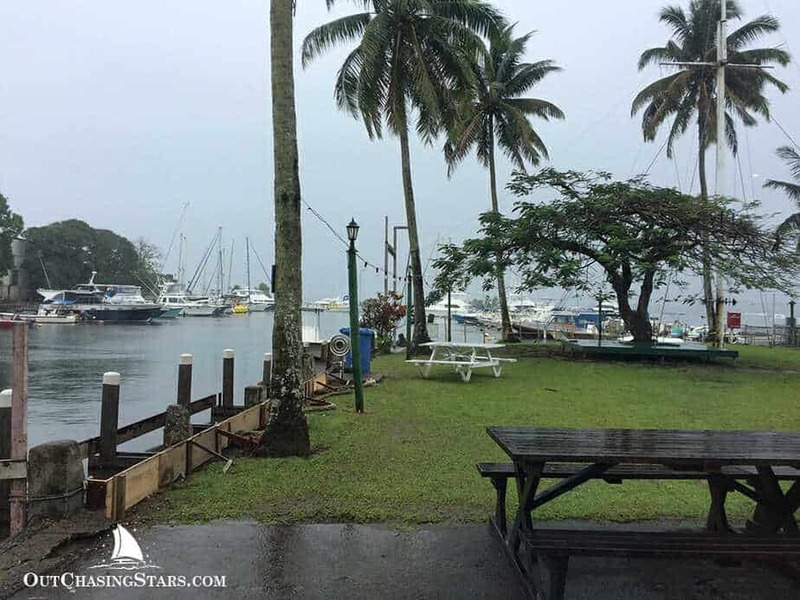 Lunch on a rainy day at The Galley at the Royal Suva Yacht Club. Nice dinner at Tiko’s, a floating restaurant! Back in Savusavu, I started to tackle provisioning. 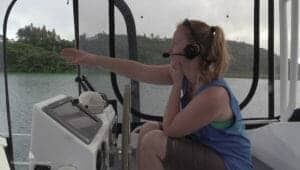 As our main goal was to head to the Laus, where there is very little shopping, I needed to provision for roughly 35 days – the time between leaving Savusavu and picking up my parents from Denarau. Savusavu is great for provisioning. There are a big variety of stores, including a new (as of last year) New World and two MH grocery stores. Sally’s Delicatessen has more specialty items, and the quality is so much better than what we saw in Tonga, especially in terms of dairy. My favorite is the Fiji Meats right next to the Waitui Marina. Their meats are vacuum sealed, and great quality. I especially like how they have packaged meats for stir fry – pork or beef. And, they have rotisserie chicken, one of my favorite things in the world. The downside of coming into Fiji from the east is that Savusavu is the further east east you can clear in, but there are many islands you have to bypass to get there. 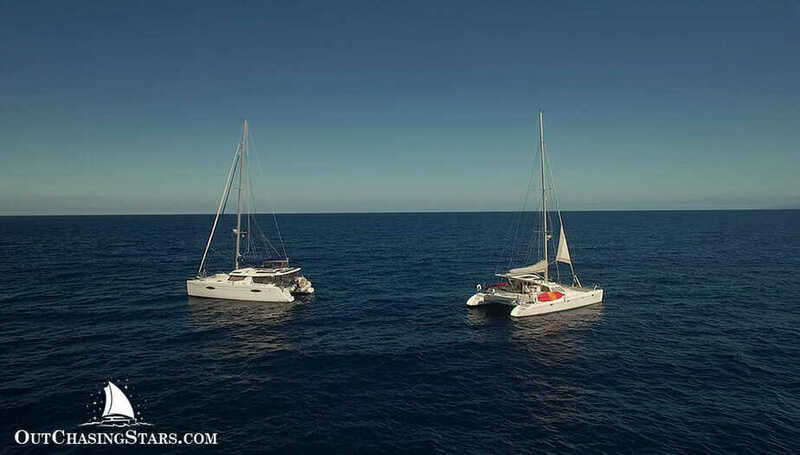 The entire Lau group is east of Savusavu, so you have to sail upwind most of the time. Cruisers wait to leave Savusavu on any wind with an N in it, but that mostly means a NE wind, so it’s still upwind sailing. 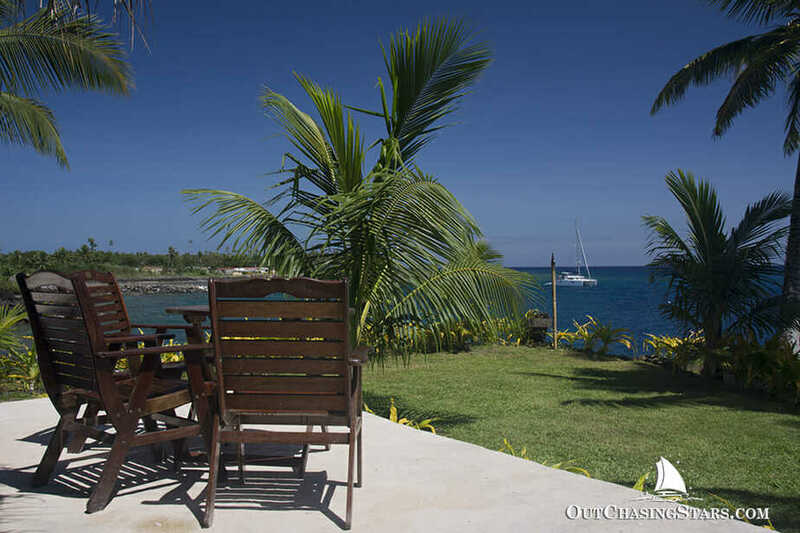 We broke it up into two legs – we left Savusavu at 10 am and headed towards Taveuni. Our friends Lewis and Alyssa from Quixotic are notorious in these waters, so we were hoping to share an anchorage with them at some point. We were disappointed to learn that they were actually sailing from Taveuni to Koro the day we were sailing to Taveuni. Oh no! Not to miss an opportunity though, we kept in touch and somehow amazingly found each other in the middle of the Koro Sea! I really didn’t think it would work out, but we turned our motors off and drifted while Lewis and Alyssa paddled over with tasties and a bottle of wine. Sure, its a ripe opportunity for piracy – a boat set adrift unmanned is technically fair game – but no one grabbed Quixotic from under our noses. It was fantastic to catch up with them – it’s their first season running their charter business, Quixotic Charters Fiji. 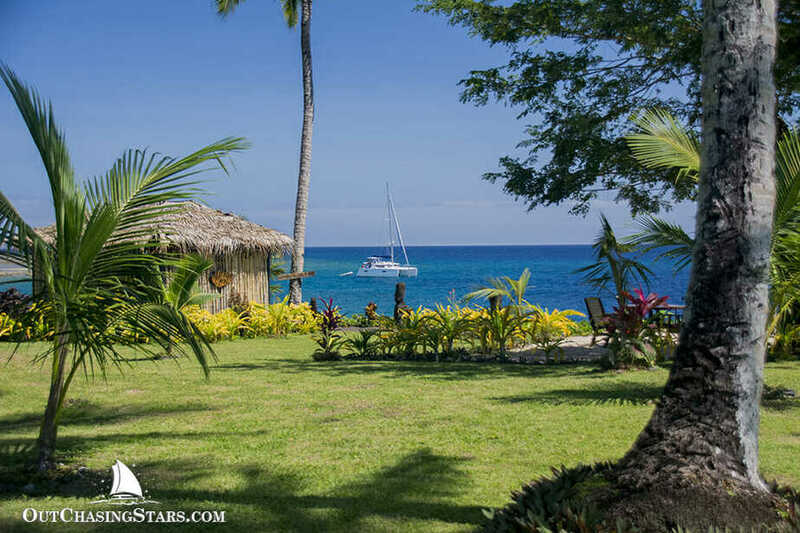 There is no bareboat charter in Fiji, and only a few liveaboard charter options. 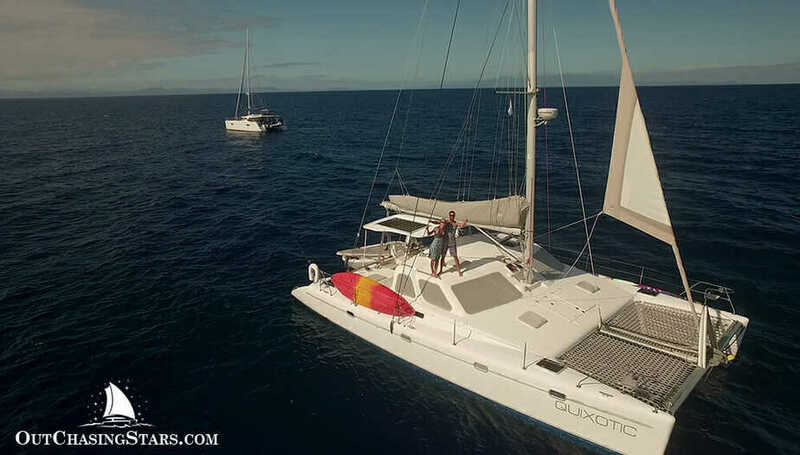 Quixotic is based in Savusavu, so it’s much easier to cruise the east side of Fiji, whereas the west side is the more touristy area. Our photo ended up in Latitude 38’s ‘Lectronic Latitude. We arrived at Paradise Resort at 6 pm and picked up a free mooring. Unfortunately, something we didn’t plan for was the swell – this mooring field (of maybe 4 balls?) is fairly open to the wind and waves. It made going to shore challenging, so David dropped me off Sunday morning to say hello. The resort was incredibly welcoming. They have a yachty introduction where they showed me around the facilities and talked about what the resort offers. The moorings and facilities are free, but they are of course hoping you will partake in some activities. I wish we’d had time for a dive, but instead we set up dinner plans for their Sunday Roast, a 3-course dinner for $60 FJD each (roughly $30 USD). I also went for a walk down to the nearby black sand beach. The beach was pretty but the sand was coarse instead of fine like we saw in Hawaii. David and I went ashore at 4:30, ready to enjoy the pool and some cocktails. The staff that I had met earlier called me by name and David got a lot of “you must be David…”. The meal and service was fantastic, and as is usually seen, a solo guitarist played a combination of cover songs and Fijian songs for the guests. We had a clear night and walked out onto the lawn and laid down to star gaze. What a perfect night! David only got a few hours’ sleep though. 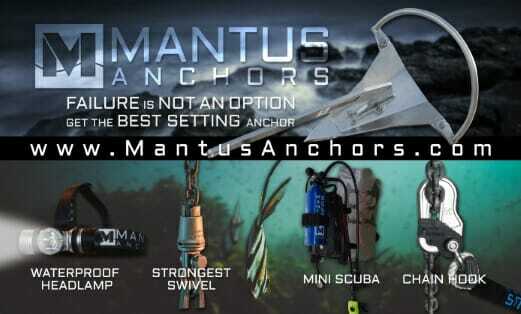 At 3:30 am he woke up, slipped our mooring, and we took off for Vanua Balavu, the northernmost stop in the Lau group. We will head to the west side shortly. It’s best to clear out of Vuda I think. And we have some definite favorites of the western islands that we plan to stop at this year! We can deliver an install our package? Absolutely. Have fun in our engine room. We will have sundowners ready when you are done!! Sorry that you argued over sending supplies to us, we are happy to bring them to you. Would have loved a picture of the taxi ride with the battens! We got video of the taxi ride! Can’t wait to see you guys!